With offices in Melbourne, Adelaide and Hobart webZplus assist businesses throughout Australia to develop their web presence and online marketing strategy. We provide fast local support, a range of hosting and design options and competitive pricing. If you are located in either Melbourne, Adelaide or Hobart and would like to discuss your web project we would be happy to meet with you face to face, this initial meeting is free and without obligation. 100% Money Back Guarantee - webZplus offers a comprehensive support program to our clients and back this with a money back guarantee - if we don't meet your expectations we will happily give you a refund! We are proud of the service we provide and the work we do, some of our clients have provided the following testimonials about us - client testimonials. webZplus Customer Service rated 4.10 out of 5 based on 9 ratings. Domain Names - webZplus offer Domain Name registration of all of the popular domain extensions, these domain names can be searched and registered directly from our website, we also provide assistance with over 250 international domain name extensions as well as online management tools to get the most from your domain name - find out more. 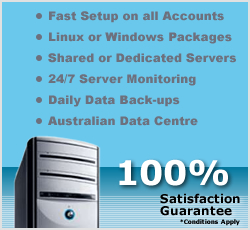 Web Hosting - Choosing a Web Hosting supplier can be a daunting task with thousands of companies just in Australia! webZplus have been providing web hosting services for over 10 years and we offer personal service, friendly advice and a range of web hosting services to get your club or your business up and running quickly - find out more. Web Design - Designing and creating a website is an important aspect of the development of your business or organization, from a simple web flyer style website to e-Commerce and multimedia rich sites that inform and engage your visitors, webZplus can offer you an 'off the shelf' website design based on our many preformatted templates or custom design a website whatever your requirements. - find out more. Search Optimisation - Put simply, Search Engine Optimisation means improving the way your website is seen by search engines. How your site is coded, the content, the layout and the popularity of your website have a big part to play in how your site ranks. At webZplus we've been optimising our website projects since before optimisation became the new hot thing, with the right tools and some careful planning search optimisation can improve your business without breaking the bank - find out more.